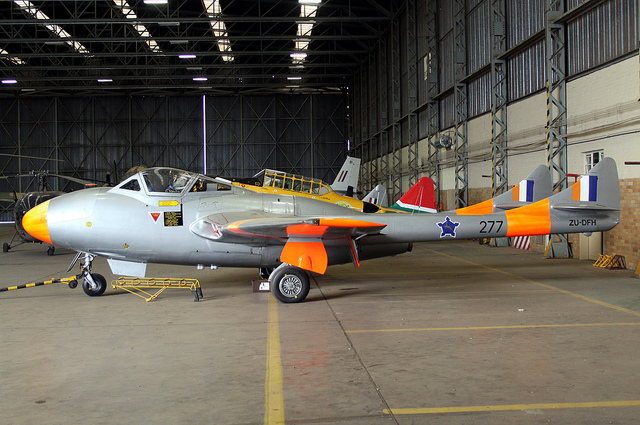 When 2 Sq returned to South Africa they were equipped with the Vampire, but in 1956 they received the Sabre Mk6. Conversion to the new Mirage III occurred in 1963 and the squadron moved to AFB Hoedspruit at the end of 1978. They continued to fly the Mirages until October 1990 when they re-equipped with the Atlas Cheetah. Spitfires were phased out in 1954 and the Short Sunderland’s in 1957. Eight Avro Shackleton Mk IIIs were delivered in 1957 for maritime patrol duties with 35 Sqn. The remaining Venturas from the maritime units were transferred to 35 Sqn before being finally retired in 1959/60. The new F-86F Sabre (ground attack version) for 1 and 2 Sqn arrived during 1956 and by 1957 each squadron had 16 Sabres, 12 Vampires and 12 Harvard’s on strength. A single Gloster Meteor III had been in South Africa from 1946-1948 and many SAAF pilots had flown it, when the choice of the first service jet fighter was made, the DH.100 Vampire FB.Mk.5 was selected. 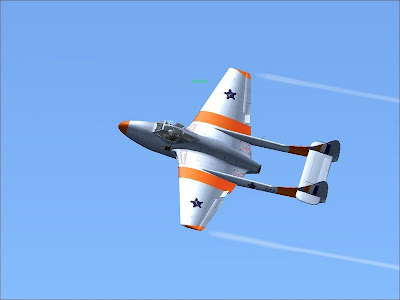 The Mk.5 is a simple, sturdy and agile jet fighter, and a stable weapons platform for air to ground operations. When fitted with long range tanks it could fly from Pretoria to Cape Town non-stop. Several Vampires set up new records doing that. The SAAF Vampires were armed with four 20mm Hispano cannon in the nose. The Spitfires sported two 20mm cannons and two 50 cal MGs. It could carry eight 3 inch rockets mounted on rails, and had hard points two 500 lb or 250 lb bombs. Initially 10 FB5 Vampires aircraft were ordered from de Havilland in 1947 ; and staff sent to the UK for training. The Watertkloof AFB runway was extended to accommodate the Vampires. 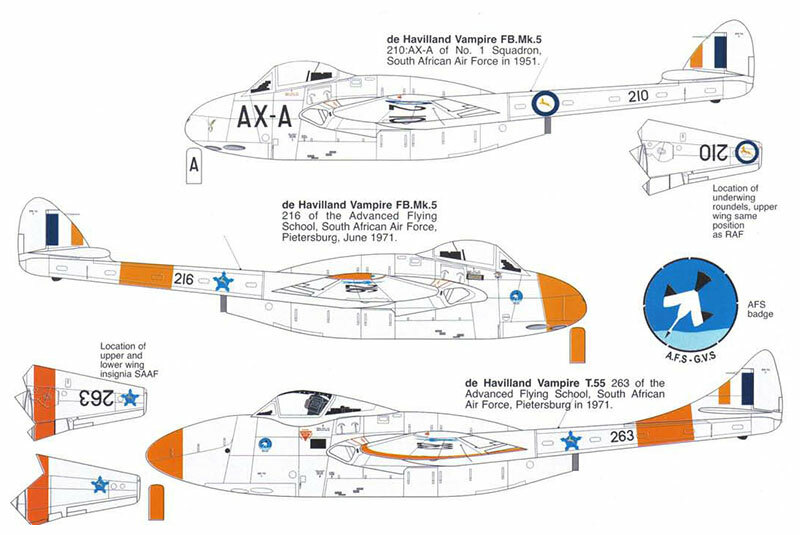 The first five Vampires arrived in Cape Town by sea in 1950 and were road freighted to Ysterplaat AFB for assembly. Serial numbers assigned were 201 to 210, numbers which had previously been used on a batch of DH.4s in 1920 and later on the Hawker Furies in the WWII era. 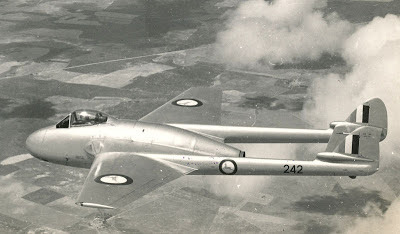 202 was the first to complete ground tests flew on 6 February 1950. 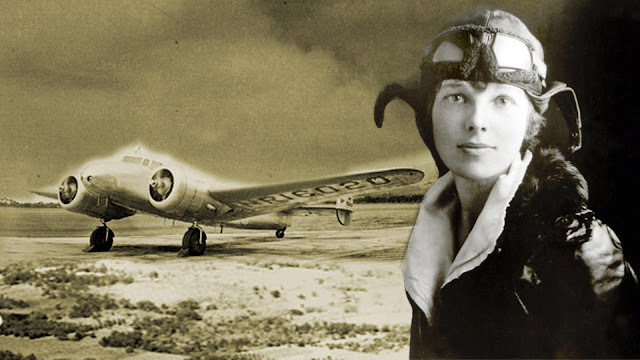 On 8 February the aircraft was moved to Fisantekraal, which had longer hard surface runways where five SAAF pilots had their baptism on the new aircraft. They were Major Krummeck, Captains Davis, Odendaal and Lt’s Cooke and Pretorius. They made their first flights on the 8th February. On 18 February the aircraft were demonstrated to the Minister of Defence, and other MP’s at Brooklyn with 202 being the aircraft flown. Four of the aircraft were flown to Bloemspruit on their ferry flight to Waterkloof AS on 3 March. Pilots were Maj Krummeck, Capt Odendaal, Lt Cooke and Lt Pretorius. ‘Tank’ Odendaal, (so named for his tank-busting role in WWII) who had the unpleasant experience of explosive decompression at 30,000 ft over Sutherland when his canopy shattered. This was to be a recurring problem with Vampires. FB 6s arrived in August 1951, ( Serial 211 to 220 ) Mk IIs in 1952 and from 1953 other marques. 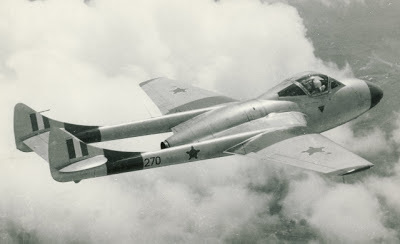 (221-226, and other serials following) FB9s (FB52s) in 1953 (227 to 256) and T55s from 1954. Can anybody help me to get in touch with Brig Tank Odendaal'Family. I have a video recording of a interview I had with him some years ago.